CytoSport, Inc., a leading sports nutrition company and maker of MUSCLE MILK® premium protein products, launched the EVOLVE® brand, the company’s first plant-based and vegan protein line. EVOLVE® products are free of dairy, soy, gluten and artificial flavors, and are made with all non-GMO ingredients. EVOLVE® protein shakes are a shelf stable, on-the-go option with only 10-11 clean, simple ingredients. Packing 20 grams of North American grown and manufactured pea protein and 10 grams of fiber, each 12 ounce ready to drink shake offers a simple option to consumers looking to make mindful choices that are considerate of the environment and themselves. The brand caters to ambitious and adventurous consumers while also being cautious of leaving a footprint on the environment. A portion of proceeds from the sale of EVOLVE® products benefits the National Park Foundation™, helping to preserve the nation’s most beautiful and iconic locations. Sustainability is an important piece of the EVOLVE® brand story. Compared to many protein options, pea protein can be more sustainable, can use fewer resources and can require significantly less fertilizer. 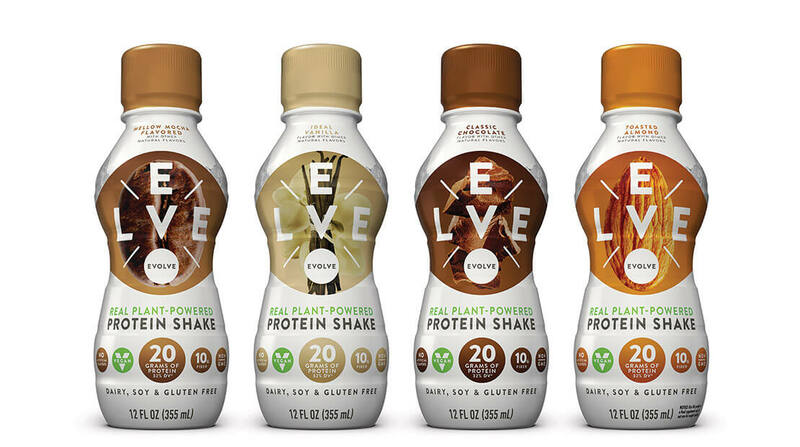 EVOLVE® shakes are available in four flavors: Classic Chocolate, Ideal Vanilla, Mellow Mocha and Toasted Almond in 12 ounce single serve bottles or four packs of 11 ounce Tetra Pak™ cartons. In addition to the ready-to-drink options, EVOLVE® Protein Powder is available in Classic Chocolate and Ideal Vanilla flavors. EVOLVE™ Protein Bars will launch this spring. For more information on the EVOLVE® brand or to receive media samples, please contact Brittany Cranston at 504-234-9077 or brittany.cranston@cytosport.com. The EVOLVE® brand was born from a team meeting in the Rocky Mountains, an idea inspired by the simplicity of its surroundings and the desire to create mindful change. It’s built on the foundation that simple is better, delicious is best. The EVOLVE® brand comes from the CytoSport, Inc. lineage, with deep roots within one of the most trusted and recognized sports nutrition companies that helped create the protein category. A sister brand to the MUSCLE MILK® brand, EVOLVE® protein products provide a plant-powered protein option for active lifestyle consumers. EVOLVE® products include only 10-11 non-GMO ingredients and are free of dairy, soy, gluten, artificial flavors and are made with North American sourced and manufactured pea protein. A portion of sales of EVOLVE® products benefits the National Park Foundation™, helping to preserve the nation’s most beautiful and iconic locations. For more information, please visit www.drinkevolve.com or follow @drinkevolve.